Team ASI gymnasts experience the fun, excitement and challenges of team gymnastics in a healthy environment. It is designed for dedicated gymnasts who have an interest in making the most out of their participation in gymnastics. We have a well-rounded team program which brings the gymnastics meet experience to all athletes from beginner to advanced. 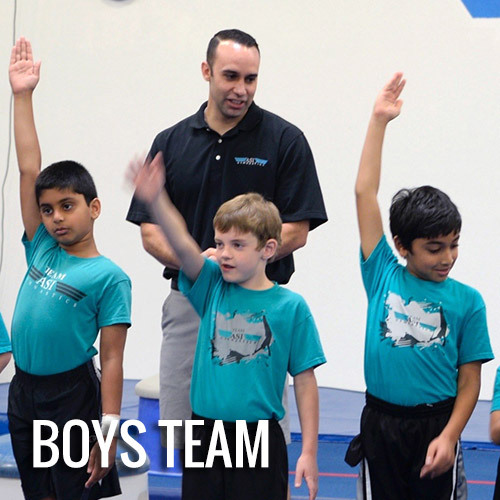 The ASI Team program is open to all gymnasts, girls and boys. The minimum age requirement is 4 years old. Girls may enter team upon completion of the Gold level class. Boys may enter team upon completion the Silver level class. It’s serious gymnastics and serious fun! Team members will workout from 2 to 25 hours per week, depending on level and interest.